Bioenergy is expected to be one of the important sectors of future advanced energy investment. Currently, a portion of the US corn and soybean crops is being processed into biofuels. In 2012, biofuels accounted for ~7% (13.8 billion gallon) of total transport fuel consumption in the United States. Corn accounted for 94% of all biofuels, but corn alone cannot meet the US government’s biofuel goal of replacing 30% of gasoline use by 2030. Corn also requires a lot of reactive fertilizer and chemicals, which can result in off-site nutrient movement and environmental pollution. A variety of state and federal energy mandates and incentives, along with various sustainability and low carbon standards, are driving interest in growing several annual and perennial crops used for producing bioenergy and bio-based materials. Ones widely grown or being developed as energy crops include: Switchgrass, Big Bluestem, Eastern Gamma grass and other prairie grasses, Sudan-sorghum, sweet sorghum, energy beet, sugarcane, Miscanthus, Arundo, Guayule, Buckeye Dandelion and hybrid Willow and Poplar. Federal incentive programs (Biomass Crop Assistance Program, BCAP) include Miscanthus giganteus and Switchgrass as dedicated energy crops. However, the demand for food from corn and other crops, usually grown on good soils, will double by 2050 as worldwide population increases. While using our best land to grow energy crops is not a logical choice, the question is: how can the economic benefits of growing crops for energy and bio-based products be balanced by the environmental concerns? To answer the question, we conducted a series of multi-state train-the-trainer workshops for professionals to equip them with knowledge-based information, teaching materials, and assessment tools to assist farmers in shifting to bioenergy feedstock production on marginal lands with enhanced ecosystem services. 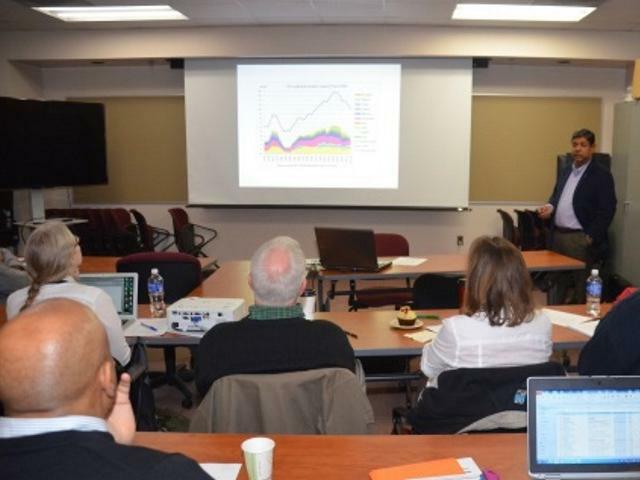 Four one-day workshop/in-service/field day events in 2014-2015 were organized in Michigan at the Kellogg Biological Station, Michigan State University; in Ohio at the Conservation Tillage and Technology Conference annual meeting and another event at the Ohio State University; and in Maryland at the University of Maryland, College Park campus. The target audience was educators and professionals from University Extension, Natural Resources Conservation Service, Soil and Water Conservation Districts, the Environmental Protection Agency and other state and federal agencies, crop consultant associations, farm organizations, ag enterprises, non-government organizations, energy professionals, bio-based company executives, students, and environmental groups. Others invited were: young and innovative farmers, farm leaders, county officials, professors, high school teachers, and bank, credit union and farm co-op officials. Speakers from the Ohio State University (Rafiq Islam, Katrina Cornish, Randall Reeder, Denny Hall, Eric Romich, John Cardina, and Vinayak Shedekar), Michigan State University (Dennis Pennington, Paul Gross, Mark Seamon, Aaron Fox, Scott Swinton, Phil Robertson, and Steve Hamilton); University of Maryland at College Park, (Bahram Momen, Jason Wight and Wendy Ann Peer), University of Nebraska-Lincoln (Ismail Dwikat); USDA-ARS Washington DC (Kate Lewis - BioPreferred Deputy Program Manager) and Michigan NRCS (Jerry Grigar) delivered their presentations at the meetings. Organizations actively involved in organizing the workshops and in-service were: Ohio State University, Michigan State University, University of Maryland at College Park, University of Nebraska at Lincoln, Ohio Bioproducts Innovation Center of The Ohio State University, USDA-Agricultural Research Service Washington D.C., Conservation Tillage and Technology Conference, Ohio No-Till Council, Soil and Water Conservation Districts and Natural Resources Conservation Service in Ohio and Michigan, and the Corn Marketing Program of Ohio. While the discussion and participation session was based on questions and answers between speakers and participants, the response and documentation part was based on post-workshop evaluations. Educational/training materials were prepared by the project partners and reviewed by a multi-state advisory panel. During these events, speakers/presentations were followed by hands-on activities (use of soil quality field test kit) and visualization of tools (OSU soil organic matter calculator), questions and answers, group discussions, and evaluation. More than 160 educators and professionals (including farmers and students) from 5 states were trained during the workshops. Evaluations of the training activities showed that more than three-fourths of the participants were very pleased with the educational materials and tools provided for teaching local farmers. On average, participants stated a 32 to 40% increase in knowledge gain on the topics covered. Among the states, the highest knowledge gain by participants was reported in Maryland (39 to 49%) followed by 32 to 42% in Ohio, and the lowest knowledge gain (25%) in Michigan. The highest knowledge gain (20 to 38%) by the participants was reported on sorghum for ethanol (39 to 45%) and Soil Organic Matter calculator (31 to 53%), followed by 31 to 43% on bio-products, 36+1% on energy crops and bio-feedstock production, and 32 to 38% on ecosystem services. About 40 to 55% of the participants recommended the use of degraded land for bio-feedstock production followed by 30 to 36% for reclaimed mine land as compared to 5 to 13% for prime agricultural land or 4 to 12% for Conservation Reserve Program land. Based on communications during and following our workshops, we expect that our training information and tools will be shared with more than 1,000 farmers by professionals.